Providing you the best range of tacrolimus capsule with effective & timely delivery. 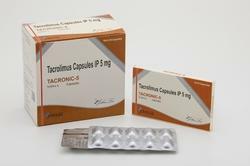 Tacrolimus is used with other medications to prevent rejection of a kidney, heart, or liver transplant. This medication belongs to a class of drugs known as immunosuppressants. It works by weakening your body’s defense system (immune system) to help your body accept the new organ as if it were your own.